Garter Stitch is the most basic knitting fabric there is. If you knit every stitch on every row, you get a very bumpy fabric known as Garter Stitch. It's a great stitch because it's simple, rather firm and sturdy, and it brings texture to your projects without any work on your part. The Garter Stitch scarf is a classic first project, but here also are some other ideas for knitting with Garter Stitch. They're all pretty easy but certainly not plain. The basic Garter Stitch Scarf is the quintessential first knitting project, and with good reason. A scarf is made with rows that have few stitches, so you make progress pretty fast. It doesn't have to fit, and you don't really even have to keep exactly the same number of stitches on each row if you can't manage. It also gives you plenty of practice with the knit stitch. This scarf is worked in bulky yarn so it knits up quick—a great confidence boost for a new knitter. The Pocket Scarf isn't really any more involved of a project than the basic Garter Stitch Scarf, but it seems like a step up just because of the addition of pockets to the ends of the scarf (you make them by just folding up the ends to the depth of pocket you would like and sewing the side seams). Working Garter Stitch in a bumpy yarn like this one brings even more texture to the party. If you're ready to add a little basic shaping to your Garter Stitch projects, check out this Garter Stitch Tie. This tie is cast on with just three stitches, then an ​easy increase (knit in the front and back) is used to get the tie to the width it needs. Use any decrease you like to shape the back part of the tie. Two-color garter stitch baby blanket. Another easy way to make Garter Stitch more interesting is to throw in stripes, as in this super warm baby blanket. Just remember that, if you want the stripes to be solid with clean breaks between them, you need to always change colors on the same side of the work (the "wrong" side will then show choppy color changes). Another great baby project that uses Garter Stitch is the Garter Stitch Bib. Bibs are great because they're basically knit washcloths with some kind of ties or closure to keep it on the child. In this case, I-cords are used, which still only require the knit stitch to make. Garter stitch eyelet lace washcloth. If you want to fancy up Garter Stitch just slightly, throw in a regular (or irregular, if that's your style) row of eyelets. Here, again, you just need basic increasing (yarn overs) and decreasing (knit 2 together) skills to bring a whole new dimension to basic Garter Stitch. Add a little fun to your exploration of Garter Stitch (and a little color to your table) with these simple three-color coasters. They're great for patriotic or summer celebrations and beyond, or knit in any colors you like. 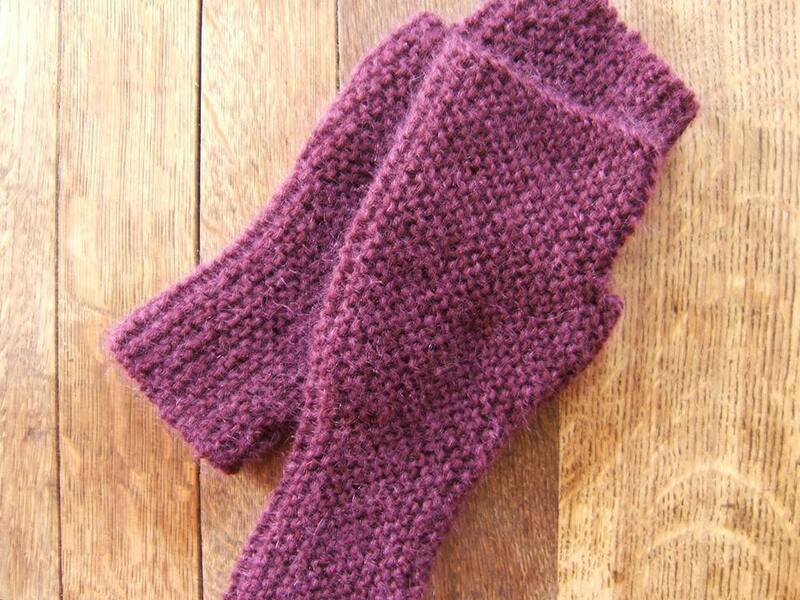 These pretty armwarmers/fingerless gloves are simple rectangles of knitting that are seamed up the side after knitting. 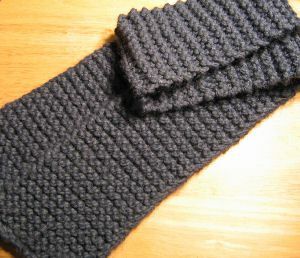 Check below for a matching headband/​earwarmer pattern, too. This easy headband incorporates a little bit of shaping and a buttonhole to give you a cute look that will keep you warm in no time flat. Garter Stitch in the round is a little different from flat knitting because you have to knit a round and then purl a round to get it to come out right. This simple cowl with a little sparkle is great for everyday or special events where you need a little extra warmth. The bias method of knitting is an easy way to give Garter Stitch squares a different look. All it involves is increasing on each side of a project up to the width you want, then back down on the other side until you get to the number of stitches you started with. I illustrated this technique with the Bias Garter Stitch Doll Blanket. A slightly more advanced thing you can do with Garter Stitch is to make color blocks in your knit fabric, as is done in this Two-Color Garter Stitch Washcloth. The technique used here, intarsia, is not really a beginner skill; this project just goes to show you that you don't necessarily have to leave Garter Stitch behind when you become a more skilled knitter.